In Yucatán we tend to stop and look down more often than usual because there’s something special which catches our eye: the floor tiles. Whether it’s because of the design, a carpet-like arrangement, the stunning color palette (or all of the above); we take a moment to admire them, take a photo (occasionally, with feet included) and, of course, share these on social media. Their distinctive features are what make an impact and we want the whole world to see them as well. Besides all this, their design and production is 100% Yucatecan. With a smile and great kindness, Don Ignacio Durán Encalada, who studied Engineering but is an entrepreneur by choice, allows me to enter the home of pasta tiles: La Peninsular store and factory. Here, traditional manufacturing methods are still used to make the iconic 20 cm by 20 cm pieces which are handmade with truly admirable dedication, care, and skill. Out of this factory, which he owns and operates, tiles have been sent to nearly every state in México, as well as New York and other cities is the US, Belize, Jamaica, Dominican Republic, Panama, Germany, France, and other countries. Over 60 pasta tile factories existed in Mérida some 50 years ago. With the arrival of industrial ceramic tiles, new architectural and design trends, and other factors, there was a crisis which culminated in the closing of many of these traditional factories. 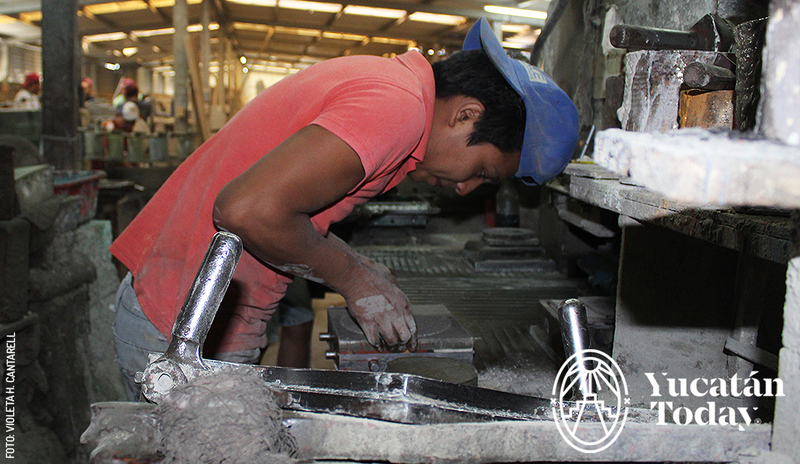 Don Ignacio first bought La Peninsular thanks to a business opportunity, and continues to manufacture pasta tiles. The rebirth of this industry came a few years ago thanks to the remodeling of old homes in Mérida’s Centro Histórico. Currently, La Peninsular has further expanded within this market with Mosaicos Dzunancán, maintaining the same vision by offering a product of excellent quality, as well as design flexibility, by personalizing colors, lines, and silhouettes, but most importantly, working with passion to keep this tradition alive. The pasta tiles we see in homes, hotels, buildings, museums, and haciendas throughout Yucatán are a part of our cultural identity, the fruits of European architectural and decorative influences, with an artisanal manufacturing technique that is maintained at Don Ignacio’s factories. The designs can be traditional, such as the ones you find in the homes of Mérida’s Centro Histórico and other neighborhoods; but there are also geometric, floral, modern, and custom motifs, such as the ones featured in the Salón Imperio restaurant in the Empire State building in New York City or resorts in the Caribbean. Don Ignacio’s favorite design? “Many,” he responds; however, he does especially mention the “Xocbichuy” (cross stitch) model which is laid out as a carpet and replicates the embroidery you find on “Ternos” and “Huipiles” (the traditional embroidered dress used in the Yucatán for formal and casual occasions accordingly), like the one on display at the Gran Museo del Mundo Maya. Tile masters with years of experience deserve special mention. With great skill and precision, these artisans pour the precise quantity of (and combine) colors, which have been previously weighed and mixed to make the desired shade, into special iron moldings (called “trepas”) which contain the design; afterwards they are pressed, removed from the molding and allowed to dry for a few days. As each one is made by hand, production is personalized, so we recommend you order your tiles well in advance. When laying these special tiles, it is extremely important to follow recommendations and instructions, as well as the proper cleaning method which guarantees they’ll maintain their shine and color. At both factories, you can personalize your order by combining colors, designs, and even by modifying the thickness of the lines and silhouettes; to this day, they still draw, scale, and make unique moldings for each type. Around the world, very few factories continue following this process, which makes Yucatecan tiles a truly high-quality cultural and decorative heritage piece. 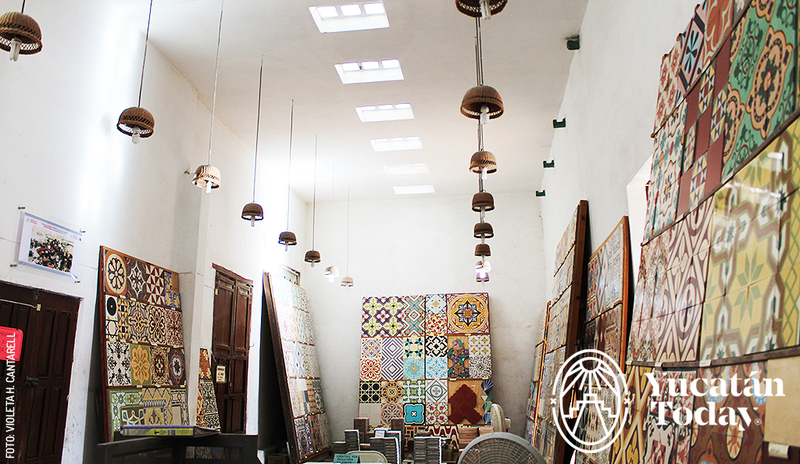 Our tiles have witnessed different events, meals, gatherings, and now, new memories with their beauty made in Yucatán.